Last updated 21 January 2019 . By Faith Strickland. For the past 20 years, Benihana has only been keeping Londoners happy with their brand of Japanese flash grilling, but that's all set to change with the first Scottish opening. With their sights set on West Nile Street, the chain are ending their UK opening freeze with a massive restaurant that will have space for more than 100 diners. 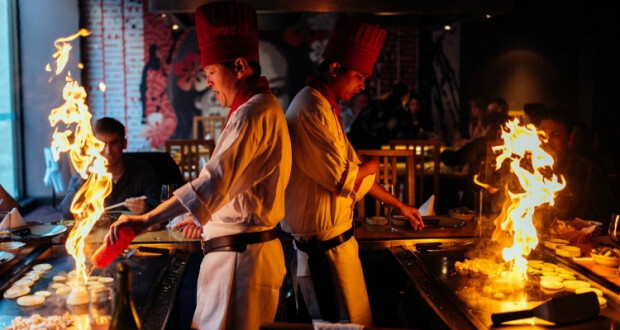 Benihana Glasgow will feature nine teppan: large iron grills which diners can sit around to watch chefs cook up their food. Combining minimalist touches with pop-culture, interiors blend pieces that include charred timbre details and anime posters, along with a stylish bar stocking plenty of Sake. Set to open sometime in spring, the new spot is only moments from Buchanan Street and will feature a menu of dishes such as California maki sushi, world-famous Wagyu beef, and Bento boxes. The cocktail menu will be just as slick, having been created by renowned The Cocktail Professor.